After a hotly contested election to determine the site of the county seat, Col. Absolam Bishop, "The Father of Decatur", caused a flag to be raised on the hill where the Courthouse now stands, showing that his choice for the site had won. Col. Bishop was so pleased with the plan of the city of McKinney, in Collin County, that he copied it for Decatur, and began selling lots around the Square for $100.00 each. The town was given the name of TAYLORSVILLE, but when Bishop became disillusioned with president Taylor, petitioned to change it to Decatur, for Steven Decatur, the naval hero. Wise County has had four Courthouses, two of which burned. The first Courthouse was a small structure, sixteen feet square, weather boarded with four inch Hack-berry boards (Cut in the West Fork of the Trinity River bottoms and shaved with a drawing knife), roofed with two foot clapboards and floored with Cottonwood puncheons. This Building had previously been owned by Henry Martin on a location near the site of what would someday be the Decatur Baptist College. When the town was platted, this small house of Mr Martin's was bought and moved to the northeast corner of the square and was the first house on the hill. The surplus room was used to store supplies pending completion of a store building under construction. The second seat of law, located on the square, was a large square, two story, frame building, forty feet by forty feet, with halls running through the bottom floor in the four directions making four rooms downstairs and one huge room upstairs, which was used as the courtroom. There was office space in this building, also. On the night of November 26, 1881, this building burned, thought to be arson. The third Courthouse was built on the northeast corner of the square, at a cost of $50,000.00. It has never been clear as to why it was not placed on the square. For many years a guard was hired to stay in the courthouse to "get the records out" in case of fire, bit this practice had been eliminated quite some time before it burned about 5:30 on the morning of January 8, 1895, also thought to be arson according to legend. 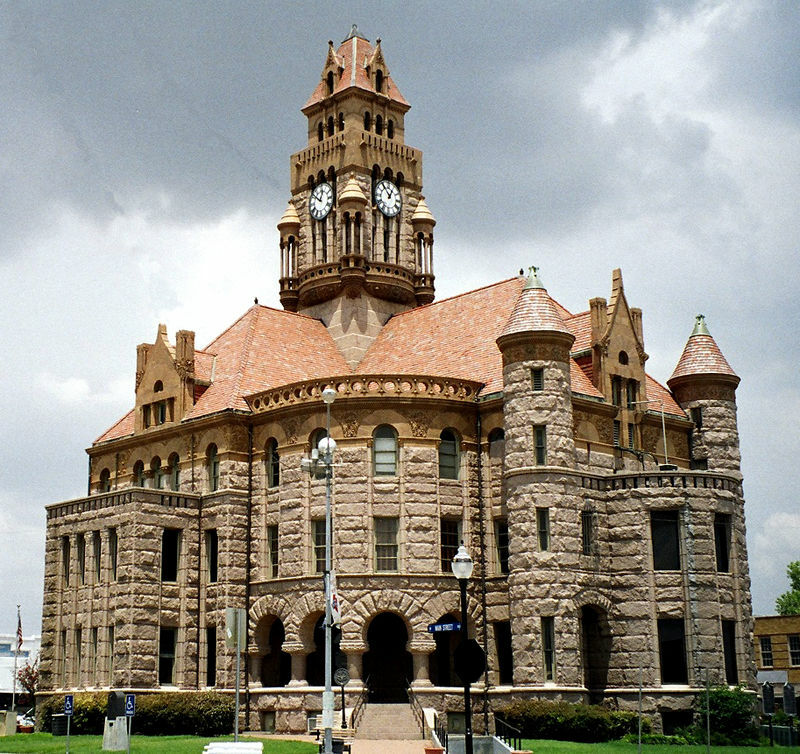 The present Courthouse, located in the middle of the square was constructed at a cost of $110,000.00, which was thought by many to be excessive, and the officials were not re-elected. the architect, J. Riley Gordon, of San Antonio, collected a fee of 5% of the construction cost. Bonds amounting to $110,000.00 were issued on may 16, 1895. The stone was pre-cut and each piece numbered then shipped from Burnet County, Texas. The stones were raised by a windlass pulled by donkeys walking in a circle drawing the rope tight. The building completed in 1896, is of pink granite with interior of Vermont marble, and has been pronounced architecturally perfect. Bids for the Courthouse clock were opened May 14,1896 and was purchased from E Howard & Company, described thus: "No. 1 Hour Strike Tower Clock, $952.00, with bell for same 2,000 lbs., $388.00, total cost $1,340.00" First court was held in the new building in December 1896. All indebtedness was paid off in 1945, and the building was modernized in t he 1960's In 1968 the Wise County Commissioners Court had 400 watt Mercury vapor light installed around the square, making the building appear ethereal when illuminated at night. The exterior was sandblasted several years ago. Some solid glass windows were installed later which is not in keeping with the original architecture. The delight of youngsters all through the years has been to go to the top of the Courthouse, up the winding stairs, to the steep wooden steps, then around the bell, up another flight of metal steps to the very top-where it seems you can see the whole wide world! One section of the winding stairs was removed when the elevator was installed several years ago. .
To tour the Courthouse contact the Decatur Main Street program. They organize the tours of the building. Decatur Main Street: 940-393-0340. The Courthouse is on the National Register, and carries the medallion and plaque attesting to it's historical value in the state of Texas.